David Corpus was still a teenager in Houston when he decided he wanted a career in banking. The youngest of six siblings, he grew up with much love and support from a mother who worked as a grocery store cashier and a father who was a truck-body manufacturer. His parents often stressed the importance of a college degree, and his father would take him to work on the weekends to give him a close-up look at blue-collar work, and eventually Corpus began to set his long-term sights on an executive position in finance. He would go on to spend more than three decades getting there, and now that he’s a senior vice president for CommunityBank of Texas, he’s helping the company support local populations while mentoring other aspiring bankers as they work to find their own way up the ranks. As a teenager, Corpus realized there were two obstacles to his dream: he needed a formal education and the appropriate skill set. Not wanting to burden his parents with his college tuition, Corpus decided he would get an entry-level job in banking and pay for it himself, so he worked at a supermarket during high school to get the cash-handling experience needed to become a teller. After high school, he applied to about ten banks in the Houston area, but it was just prior to the oil bust and the savings and loan (S&L) crisis of the mid-1980s and early 1990s. Only one bank called him, twenty-five miles from his house. Corpus went to college at night and on weekends, and over the course of ten years, he steadily chipped away at his undergraduate degree. After that, he entered and completed a two-year MBA program, spending his evenings teaching business courses at Houston Community College as an adjunct instructor while still working full-time at the bank. For those first thirteen years of his career, he worked for a small bank that had one branch and $75 million in assets. Because the bank had good credit quality and liquidity, it would get calls from banking regulators who asked if it wanted to buy banks and S&Ls that were at risk of failing during the crisis. Corpus got firsthand experience learning the importance of due diligence when making acquisitions. By 1998, Corpus’s small bank had grown to twenty-six locations and $1.3 billion in assets. It sold out to a large corporate bank, and Corpus signed on at another small bank with the task of helping it grow. With Corpus’ assistance, the bank’s owner, Dane Grant—who Corpus considers his primary mentor and still meets for lunch—grew the bank to two-and-a-half times the size it had been when Corpus joined. Once it was profitable, he sold it, and Corpus continued with the acquiring bank for five more years. Given his experience with the difficulties of executive success, Corpus directs his own compassion toward helping other young Latinos find their way through the ranks of the industry. He has seen many aspiring bankers mired in lower-level jobs simply because they don’t know how to plug into management programs or network to make themselves visible. Corpus works informally with students coming out of college, advises them, and puts in calls to help them meet bankers looking for talent. 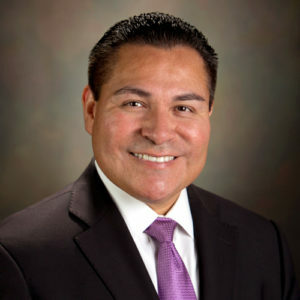 In 2013, former Governor Rick Perry appointed David Corpus to a six-year term on the board of trustees of the Teacher Retirement System of Texas. It’s the sixth-largest public pension fund in the US, serving more than 1.5 million public and higher education employees through an investment portfolio of more than $140 billion. Corpus sits on the following committees: Audit, Investment, Risk, and Policy, of which he is chairman. “Having personally benefited from Texas’ public school system, serving on the board of trustees provides me with an opportunity to give back and help ensure that educators and their beneficiaries in Texas get the most out of their retirement benefits,” Corpus says.